Boningtons Auctioneers, Chelmsford, will this week host a sale which features two oil paintings by Sir Winston Churchill. This is the first time a regional auction house has ever offered original works by Churchill. The pictures will be offered on 27th July at Bonington's saleroom in Epping, where Churchill served as MP between 1924 and 1945. One of the paintings, depicts the Giza Pyramids at Cairo whilst the other captures Miami Beach. Churchill was known for painting during his travels, having produced over 500 paintings during his lifetime. Sir Winston Churchill, O.M., R.A. (British, 1874-1965): The Giza Pyramids at Cairo, oil on canvas, signed with initials, H 71 x W 91.4 cm. Both paintings are the property of a private collector who himself acquired them at auction some years ago. 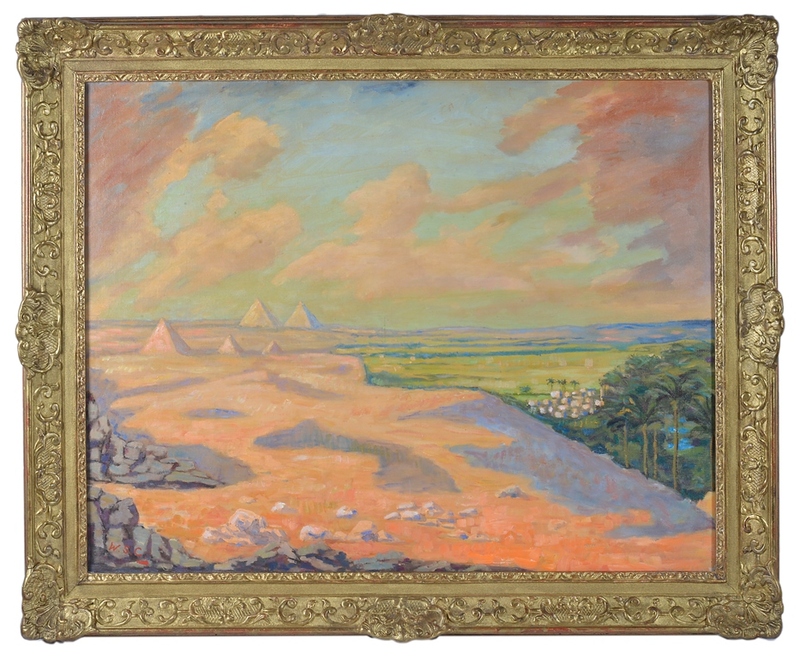 The larger of the two, a 70 x 90 cm oil on canvas depicting the Giza Pyramids at Cairo, is estimated at £400 000-600 000. Painted circa 1946, it was given as a gift by Churchill to his close friend Field Marshall Jan Christian Smuts. The present work was hung in the General's study at his home. Churchill gave the General another painting, which was hung at Libertas, Pretoria, was stolen in 1972 never to be traced. The second picture is a slightly smaller oil on canvas depicting a view from the Venetian Causeway, Miami Beach, Florida. In January 1946, Churchill and his wife Clementine arrived in Florida for a six week visit for their first extended holiday after World War II. 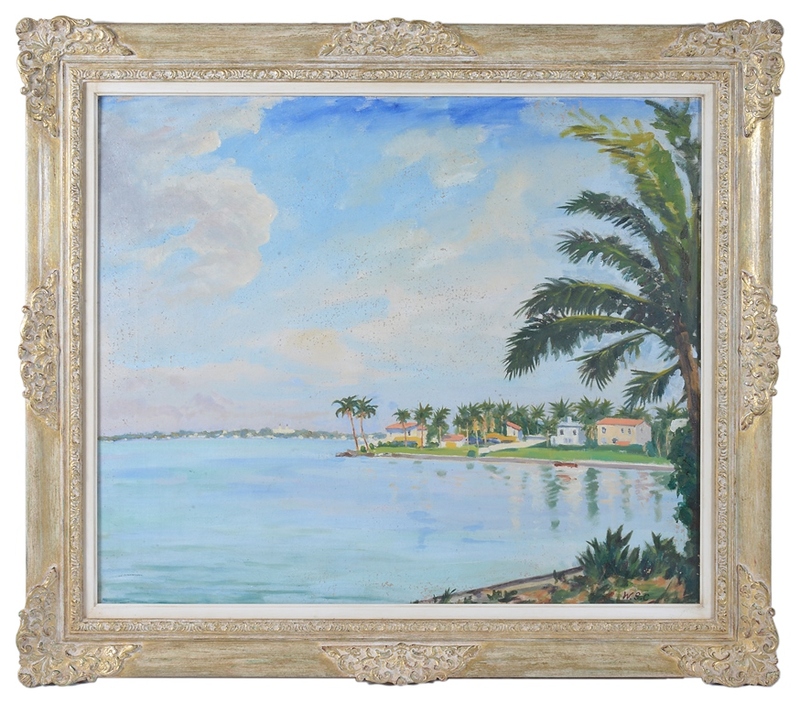 There they stayed at the Miami Beach home of Canadian Industrialist Colonel Frank W. Clarke and Churchill did not hesitate in venturing out to paint the local scenery. 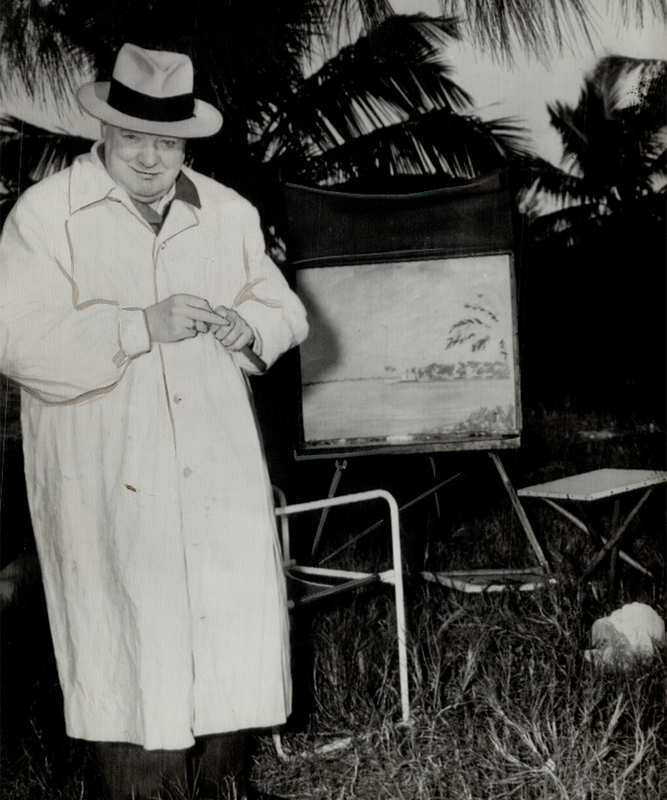 A contemporary photograph shows Churchill standing before palm trees alongside an easel upon which sits our picture, half finished. Churchill later gave the painting as a gift to Colonel Clarke and his wife. This piece has been estimated to fetch £150 000-250 000. 50 years after his death, Churchill's artistic efforts have been brought into the spotlight. He has been described by his biographer David Coombs as a ''serious and intelligent painter,'' as indicated by his close friendships with Sir John Lavery, whom he studied under, Sickert and William Nicholson. Churchill also closely studied and was influenced by Turner, Cézanne, Monet and John Singer Sargent. A recent sale of Churchill's paintings by Mary Soames, his youngest daughter saw his work The Goldish Pool at Chartwell fetch £1.5million, the highest price ever paid for a work by Churchill at auction. Check out Boningtons on Barnebys here.